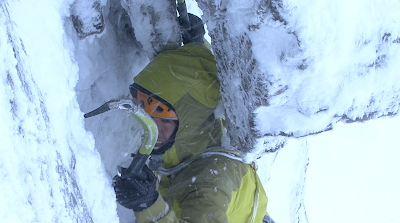 Last week we had a fantastic time climbing and filming on Ben Nevis. 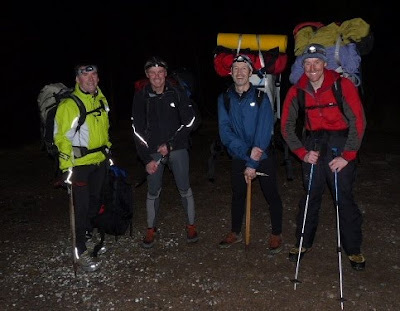 By day we were running and climbing all over the mountain trying to keep up with Dave MacLeod and Andy Turner as they repeated all the Smith- Marshall routes from that famous week in 1960. 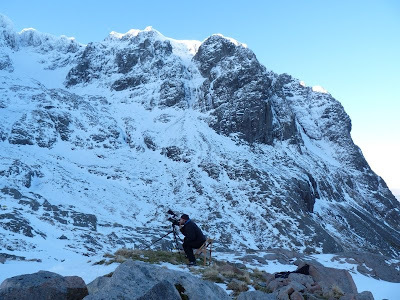 By night we were capturing footage and editing clips on a wind powered laptop whilst drinking whisky! 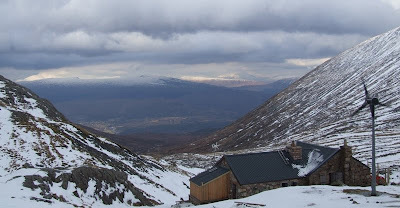 The CIC Hut, our home for the week. 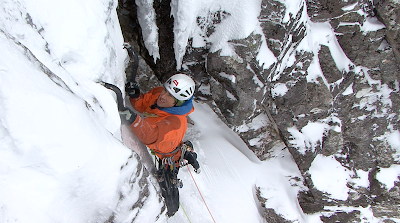 I’ve been back in Edinburgh now for a couple of days and I’m still amazed that we managed to pull it off and get all the routes climbed and more importantly to me, filmed well. 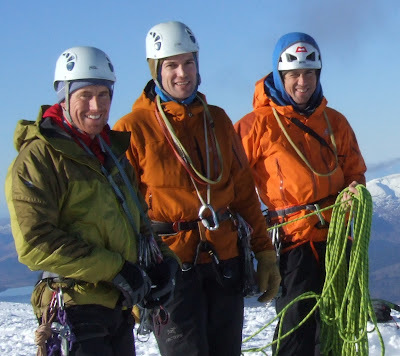 As well as climbing all the routes, Dave was instrumental in the planning and logistics that went into this project. Andy enjoys getting the Hot Aches! This was the first time I had worked with Andy and he was brilliant to work with. 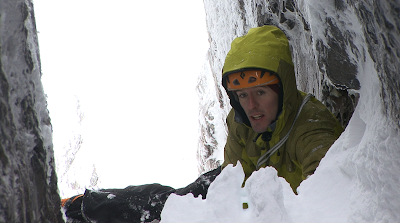 Climbing routes for camera requires a lot of waiting around and faffing; Andy's patience was wonderful. He also had to put up with me kicking snow on his head from above for the whole week. 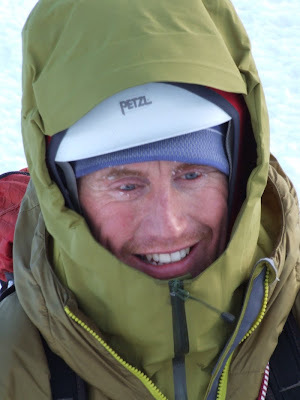 Donald King did a superb job of looking after me and ensuring my safety on the mountain, rigging routes and getting me into some fantastic positions to shoot the climbing. 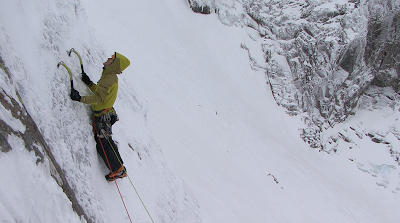 Guy was my second cameraman on this shoot and he captured some beautiful long shots of the climbers from all angles. 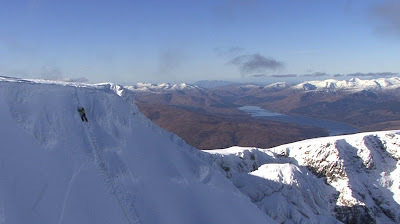 His work really illustrates what an amazing mountain Ben Nevis is. 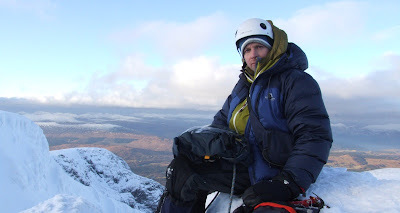 Mike is the director of the Fort William Mountain Festival, a driving force behind this project. Three members of the Lochaber Athletics Club help Donald King (right) with some kit. Thanks to all the members of the club who helped us over the week by running up to the hut to collect media and deliver supplies. 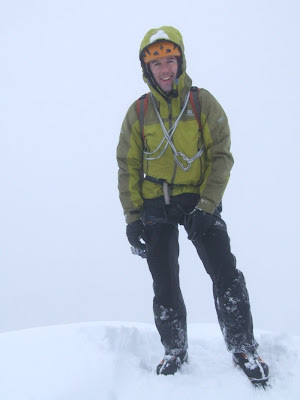 Paul Prentice from The Mountain Boot Company kitted out myself and Guy with nice new axes and crampons for the week. Thanks to Claire for her support and website work over the week. 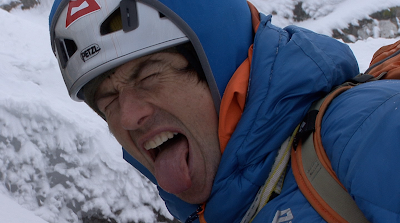 Finally, without the support of Mountain Equipment this project could not have happened at all. Richard Woodall, marketing Manager at ME, backed the project right from the start. Despite the risk that nothing might come of it because of adverse weather and climbing conditions he committed support from ME. I can remember him saying to me back in early January, “ok, it might be worth a punt!”. I’m going to craft all this footage into a film or films for release in the Autumn, just in time to get everyone psyched for the next winter season. How many layers? Free DVD to the first correct answer! 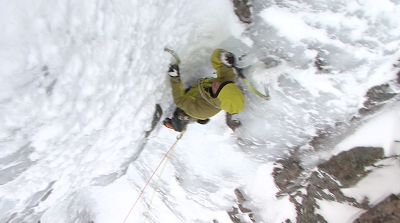 Day three of the Smith-Marshall Project and Dave and Andy climb Minus Three Gully. 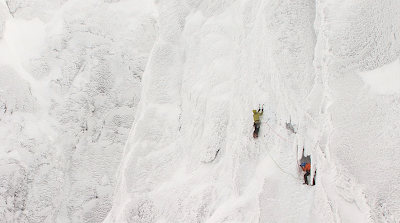 Here is a clip of Dave Macleod and Andy Turner climbing Pigott's Route as part of the Smith-Marshall Week film project.